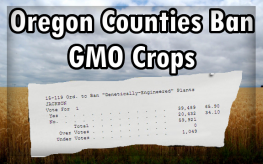 Despite biotech companies spending more than $1.3 million to try to defeat the measures of several Oregon counties to ban GMOs from their food supply, two counties have successfully eradicated genetically modified organisms from their cities. The newly approved measure mandates that people “cease harvest, and destroy or remove all genetically engineered plants” no later than 12 months after the ordinance goes into effect. 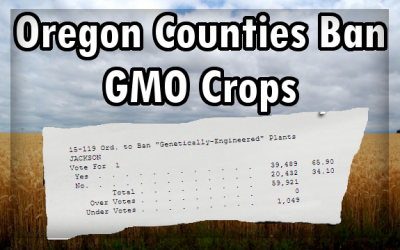 With Jackson County’s measure 15-119 and nearby Josephine County’s measure 17-58, GMOs were voted out with a nearly 2-1 ratio. “The voters here [Jackson County] have many generations of fruit and vegetable growing, so they’re among the most educated voters,” said Chuck Burr, president of the Southern Oregon Seed Growers Association.” The opposition spent a million dollars and couldn’t convince the people. This vote is going to make Jackson and Josephine county one of the most valuable seed-growing regions in the entire country, period,” he said. This is a huge win, especially since Gov. John Kitzhaber signed a bill last fall that prohibits local governments from regulating genetically engineered crops. An exception was made for Jackson County because its measure had already qualified for the voting ballot. Portland, Oregon, residents, for instance voted emphatically to ban GMOs. “We fought the most powerful and influential chemical companies in the world and we won,” local farmer and anti-GMO advocate Elise Higley told the Oregonian. “It’s a great day for the people of Oregon who care about sustainability and healthy ecosystems,” added the group GMO Free Oregon on its Facebook page. Voters helped these measures to ban GMOs go through, but so did contributors that raised $375,000 to help defeat biotech. The leading out-of-state contributor was Dr. Bronner’s Magic Soaps, which spent $40,000 to help support the ban. Meanwhile, three major agribusiness firms – Monsanto, Syngenta and DuPont Pioneer – contributed almost half a million on their own. Too bad ill-gotten money doesn’t go very far. You can’t poison a nation forever, and expect to get away with it. Now, if we can just get criminal legislation to pass for big corporations who sell and cultivate GMOs, as Russia is in the process of doing, we can really say goodbye to these Frankenfoods.